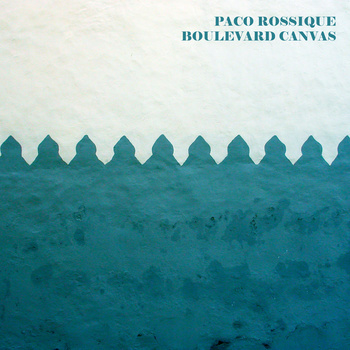 Etched Traumas is more than happy to present the second EP of the Spanish artist Paco Rossique titled ‘Boulevard Canvas‘. Paco Rossique lives and works in Las Palmas de Gran Canaria (Spain). He has lived and studied in Madrid and Florence (Italy). With a career spanning over twenty years as an artist, his work include paintings, murals, sound art pieces, sculptures, prints, magazine articles, art-books, illustrations for newspapers and curatorship. His paintings have been exhibited in Madrid, Jaen, Valencia, Baeza, Irun, Malaga, Tenerife, La Palma, Lanzarote and Gran Canaria. He has made more than a dozen indoor and outdoor murals in Gran Canaria, La Palma, Jaen and Granada, highlighting Cuyαs Theatre murals in Las Palmas de Gran Canaria and those in Jaιn and Granada in close collaboration with the architect Francisco Jesús Pérez Chica. Among his most important sculptures which are quoted in the park Arrecife, Lanzarote and Las Palmas de Gran Canaria at the headquarters of the FEDAC and Teatro Cuyαs. He has composed sound art pieces, such as those for the exhibition “90% Water” with Mónica Aranegui and Jose J. Torres in the Library of the University Carlos III, Madrid 2011, Soundtracks for the “Land for the future: sustainable development” in the Elder Museum of Science and Technology Las Palmas de Gran Canaria and soundtrack “Planning the insular Landscape.” Special Territorial Plan of the landscape of Gran Canaria. Biennial of the Canaries 2009. This entry was posted in News and tagged avantgarde, contemporary, experimental, field recordings, Las Palmas de Gran Canaria, Paco Rossique, percussion, Rossique, Spain by bsom. Bookmark the permalink.